Obituary – Mills, Richard Henry « Perry High School Alumni Association, Inc.
﻿F.F.A. 49-50, Home Room Vice—President 49-50. ﻿Richard Henry Mills, 52, 1404 Eighth street, was found dead at his home early Tuesday. Funeral arrangements were pending Tuesday at Parker Funeral home. Mills was born in Perry, Nov. 21, 1929, the son of H. G. and Opal (Hughes) Mills. He was a graduate of Perry high school. 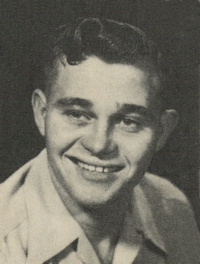 He and Dixie Myers were married Oct. 2, 1954, at Stillwater. Mills served with the United States Army in Korea and was a mechanic with the state department of transportation for 26 years. He was a member of the First Baptist church. in addition to Mrs. Mills, of the home, survivors include three sons, Kevin Ray Mills, Wewoka; Kelly Wyn Mills, of the U.S. Navy; and Khris Lyn Mills, Perry; his mother, Opal Mills, Perry; and three grandchildren. He was preceded in death by his father and one brother.